Funny how things always seem to tie together. I have been studying the heart in scripture as I shared on this blog last spring, but my exploring did not stop there God just directed me down different paths. 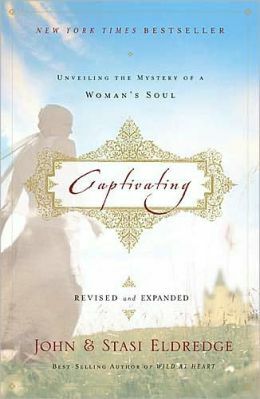 One such path was to pick up and read the book Captivating by John & Stasi Eldredge. My daughter had given me this book to read about a year ago, but I guess God needed me to wait in order to fully feel the power of this book. It is one of my all time favorite reads and I can not wait to read more of their work as well as this one again and again. Of course, the book lead me to their website where I explored around and subscribed to a daily email. These daily readings have been a blessing for me. Amazing how they speak right to me when I need it the most. Each reading is an except from one of their books, but is a devotional that sets my day and my life in order. John and Stasi keep me thinking about how I love God, serve God, worship God, and live God! I just wanted to take the time to share how much their writings have added to my scripture study on the heart. Continuing to challenge yourself to grow in the Lord is hard sometimes. We all get wrapped up in the day-to-day life and forget the passion we should have for Christ each and every day. As God takes and creates a new heart for me, may I be bold enough to follow him and his call in my life. May I share his love in my life each day, so that others see his work not mine.